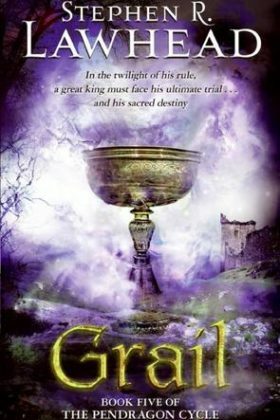 Arthur is grievously injured — until a secret relic is brought before the dying King; a Holy Grail that heals his wounds and restores his vigor. But soon evil enters the royal court in the guise of a beautiful maiden. Book 5 of The Pendragon Cycle series, medieval fantasy for adult readers. In the twilight of his rule, a great king must face his ultimate trial … and his sacred destiny. Drought, plague, and war have left the Isle of the Mighty battered and its heart, the beloved Arthur, grievously injured — until a secret relic is brought before the dying King; a Holy Grail that heals his wounds and restores his vigor. But soon evil enters the royal court in the guise of a beautiful maiden; a soulless, malevolent force capable of seducing the King’s loyal champion, confounding the sage whom some call Merlin, and carrying the sacred Grail — and Arthur’s adored Queen — off into the dark unknown. And now Arthur faces the greatest challenge of his sovereignty: a quest of recovery that must lead the noble liege through realms of magic and the undead, on a trail that winds inexorably toward a grim confrontation with his most foul nemesis . . . and his destiny. Book 5 of The Pendragon Cycle series, medieval fantasy for adult readers.